Love the colors of fall? Here are our faves and how to get them in your house! Fall colors do not just have to be outside on tree-lined roads. You can bring them into your home to create that perfect autumn feel with just a few simple changes. Whether you are changing the curtains, adding in subtle decor hints or you have decided to repaint your home, here are some fun colors to keep that autumn feeling close at hand. 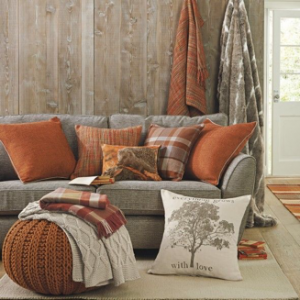 While summer design tends to be light and airy, fall brings the desire to have a cozy space with deeper tones. A great way to make your home feel more like fall is to add darker colors to replace the bright summer ones you currently have. In all fairness, it can be difficult to redesign your home with every season, so try to not stress about it and make it simple by adding a pillow or throw to any existing space to change the look. The first color to add to your home is brown. While black will always be a staple color, we are seeing a lot of people turn to adding shades of brown to their home. Whether you add an oversized chocolate brown blanket or a wood table, you are making your home fall ready. With brown being an earthy tone, it adds warmth and comfort to any space. 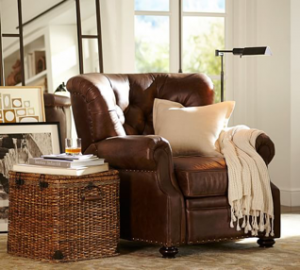 Add a warm, dark or light brown element to any room to help bring your home into the fall season. often used in homes all year long with plants, it is time to take it to the next level. Switch out your summer flowers for a beautiful deep green plant. Add forest green pillows or a muted green lamp to any space. Green is a color that can be easy to add to any room because it can almost be neutral. 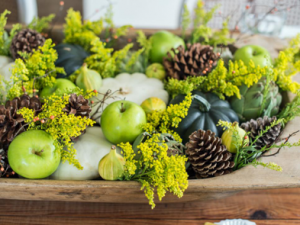 A simple solution is to place green apples and plants together on a table or mantel to make a fun centerpiece for friends and family to gather around. Another color to add to your space for a fall-feel is blue. Think more cobalt and navy rather than light, sky blues. Fun blue pillows can add color as well as warmth this fall. Mixing different shades of blue can add dimension and texture. 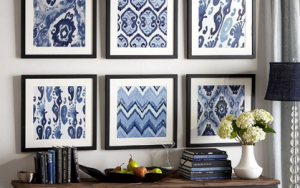 Finish off any space with blue artwork on the walls, or complete any sitting area or bedroom with a blue throw and your space will feel inviting and cozy. Now, we’re heading into pumpkin territory, with orange. Adding pops of burnt or golden orange in the form of flowers, rugs or even paint colors if you’re looking for a true autunmal feel. A fun orange lamp on any side table will help invite your guests into a warm, relaxing space. The last color to add to your home this fall is red. 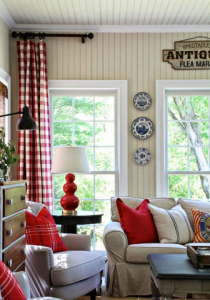 Red is a classic fall color that can be very easy to incorporate into any space. With many shades to choose from you really cannot go wrong. Whether you decide to add red flowers to bring your space to life or an assortment of red accessories, you will be holding up a cup of hot apple cider in no time. Deep red shades add warmth while brighter reds can help keep the feel of the space more inviting. Whether you want to add a couple fall colors or just one to your home this year, you really will find subtle changes make a big difference from season to season. Plus, there is no need for construction workers. This upcoming fall swap out your light colors with some deep, rich tones in any of these colors to give your home the cozy fall feel you want. For more information about how H.J. Martin and Son can help you bring Fall into your home, visit us online at www.hjmartin.com!